At B’nai Or, congregants get up during services to spontaneously dance to the tune of the prayers. Led by a rabbi clad in jeans, they take deep breaths and meditate. They sing Jospel, Jewish gospel, and replace a Jewish prayer about love with a Sufi or Native American prayer on the same theme. The congregants, who meet weekly at the Andover Newton Theological Seminary, are artsy, spiritual and inventive. One song they have incorporated in their services, “Ilu Finu,” meaning “Were our mouths,” is by Vocolot, a women’s a cappella group based in San Francisco. On its Web site, the group says it performs “original music with universal heart, Jewish soul and social conscience” – a description that also captures the spirit of B’nai Or. The congregation is bringing Vocolot to town March 21 at 7:30 p.m. for a fundraising concert at Temple Ohabei Shalom in Brookline. 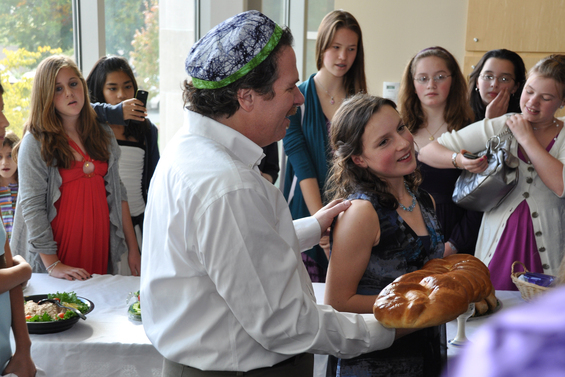 B’nai Or Rabbi Lev Baesh with Eliza Beth Chodos at her bat mitzvah.